Wendy attended California State Polytechnic University, Pomona where she majored in animal science, taking classes such as biology, anatomy and physiology, endocrinology, parasitology, animal reproduction, and zoology. Wendy worked multiple equine jobs including a live-in position at the W.K. Kellogg Arabian Horse Center where she assisted with breeding, foaling, and equine care. She joined the Intercollegiate Horse Show Team and the Cal Poly Equestrian Drill team where she quickly became team captain, supervising team members and horses. Wendy loved giving horseback riding lessons at a local horse ranch and volunteering her time for equine exercising and training. While she enjoyed working with horses, she also enjoyed an internship at the San Diego Zoo, where she felt extremely fortunate to work with pandas, elephants, polar bears, and tigers. She then interned at Wild Wonders where she discovered a great interest in wildlife education, teaching the public about animals such as binturongs, wallabies, monkeys, and various reptiles. 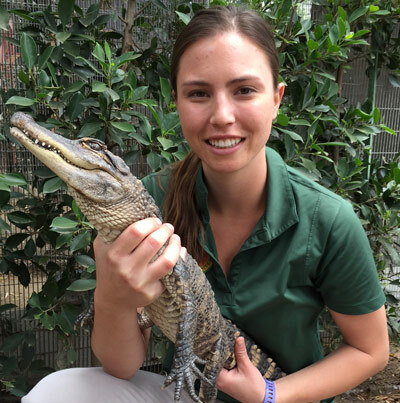 Since relocating to Los Angeles, Wendy made her dreams of working with exotic animals a reality, and is excited to be a Wildlife Biologist at Wildlife Learning Center where she continues to learn every day.